I’m a little bit birthdayed out, to tell you the truth. It seems to me like half the people I know, myself included, are January babies. Someone told me this is because a lot of people get frisky around Springtime, and hence: lots and lots of January-babies. Last week was my sister’s 30th birthday, and she had a big party with family and friends. I’m not a fan of cupcakes, personally, but since she requested them, and she was the birthday girl, I obliged. 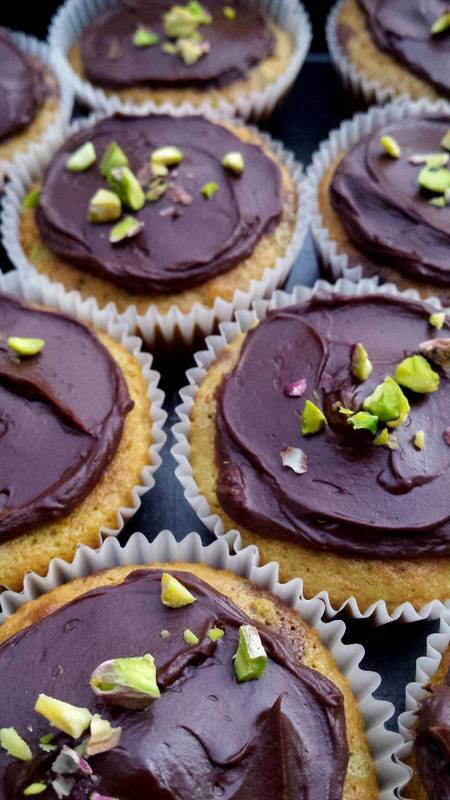 And since she loves pistachio, I decided to try my hand at chocolate and pistachio cupcakes. 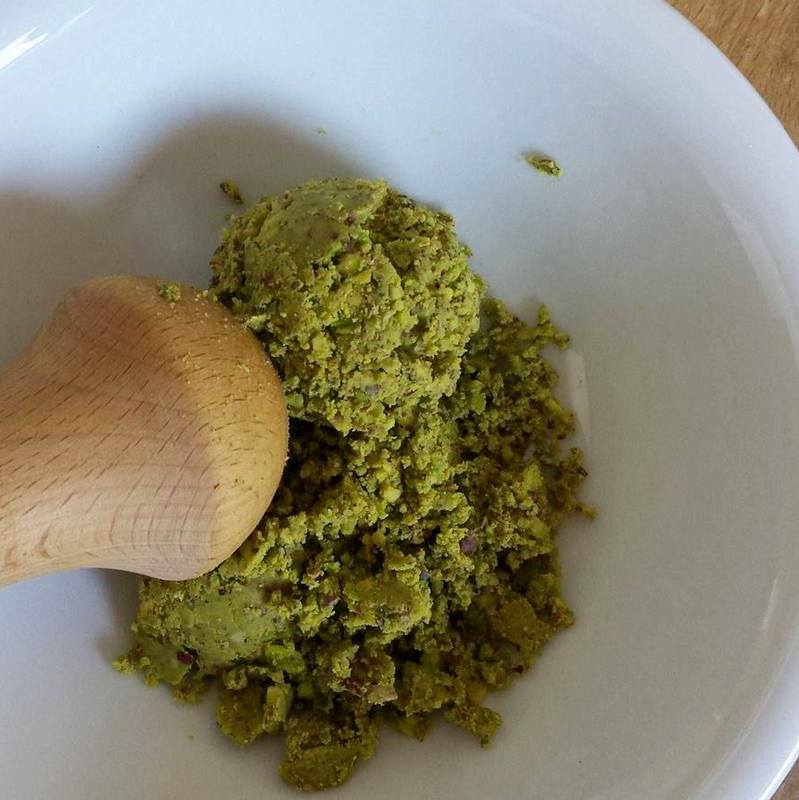 I even ground the pistachios into pistachio paste by hand, not having been able to locate any pistachio paste in any of my local supermarkets or health stores. I can still feel my pecs. 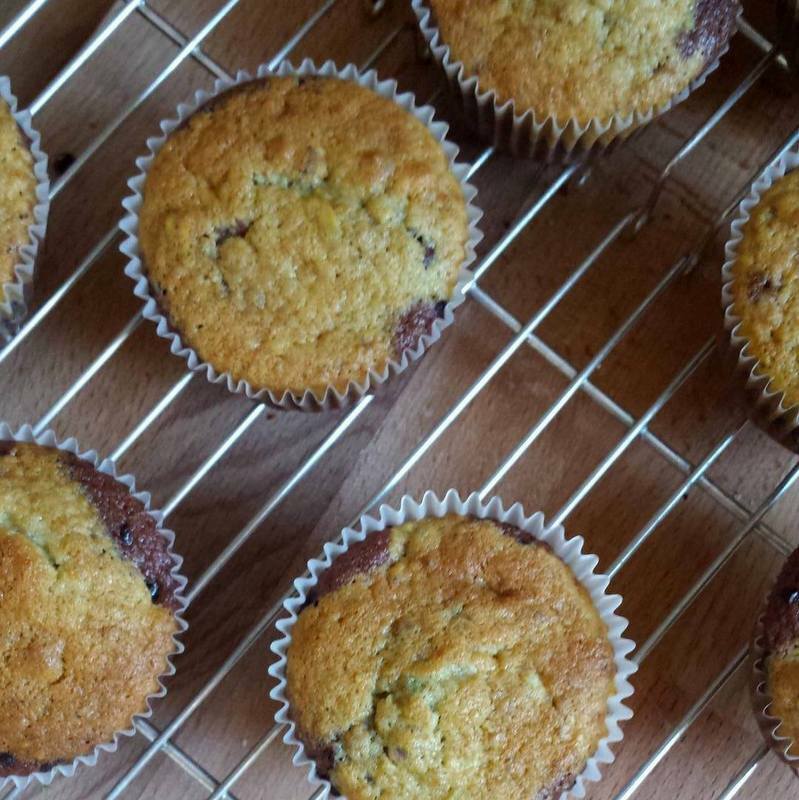 I’ll definitely make them again, pistachio paste included, with slightly less chocolate next time! Make the ganache by heating up the cream (e.g. in the microwave for a minute or two on high), and pouring it over the chocolate chunks. Leave for a good five minutes, then stir until you have a glossy ganache. If some of the chocolate is still in chunks, place the bowl back into the microwave for about 10 seconds on high, and then continue stirring. 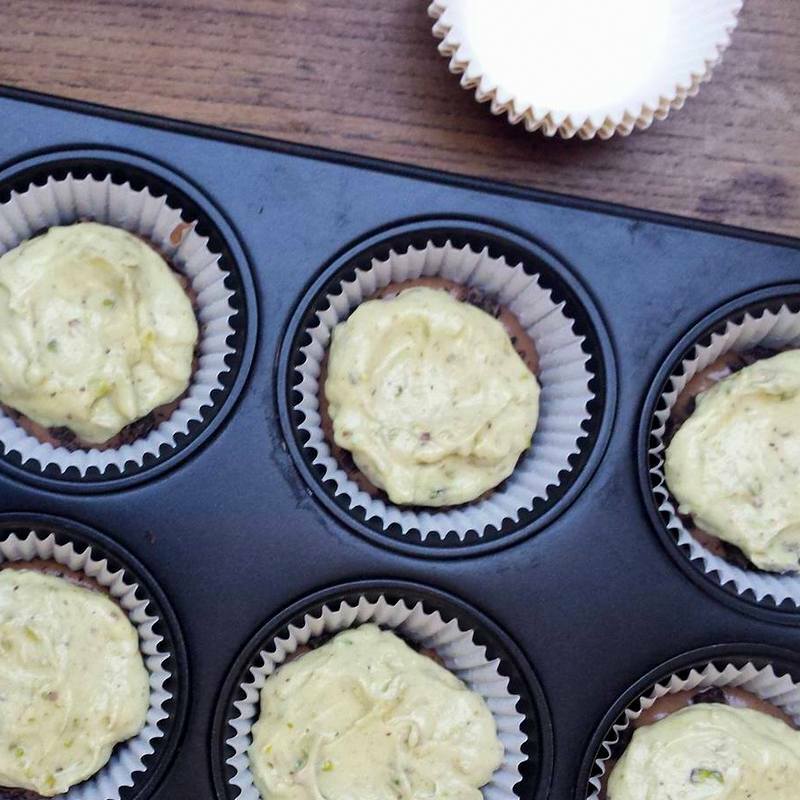 Set aside to cool down and thicken while you make your cupcakes. Roughly chop the pistachios using a serrated knife. 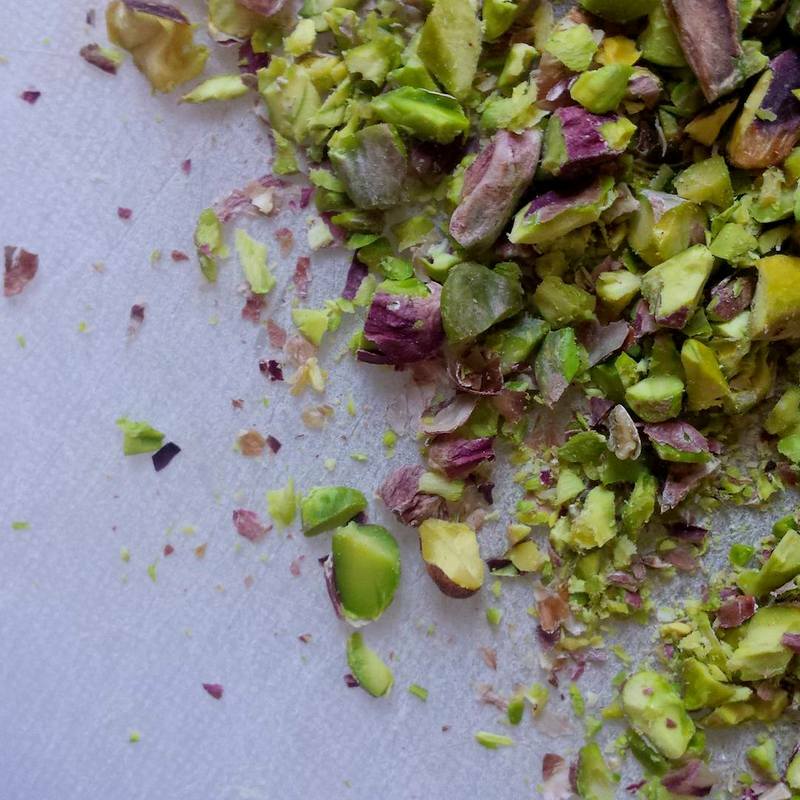 Reserve 20 g of the pistachios for decoration, 60 g to add to the batter, and 40 g to make your pistachio paste: place the 40 g of pistachios in a mortar, and grind them until they start to look like a paste. Add the icing sugar, and keep grinding until the mixture isn’t dry, and the bits of pistachio stick to each other. 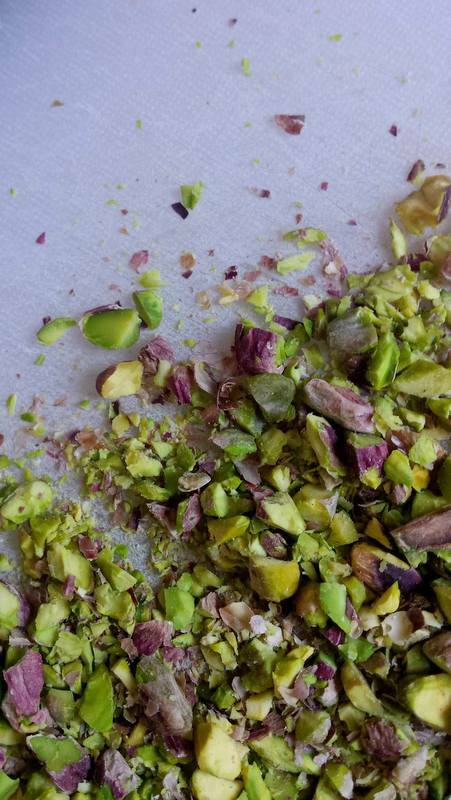 This can also be done in a food-processor, I suppose, but due to the small quantity, I was a bit worried my pistachios would simply get stuck in the blades 😉 This process took about 20 minutes, maybe a bit more. Using the same chopping board and knife, chop the dark chocolate, and set aside. 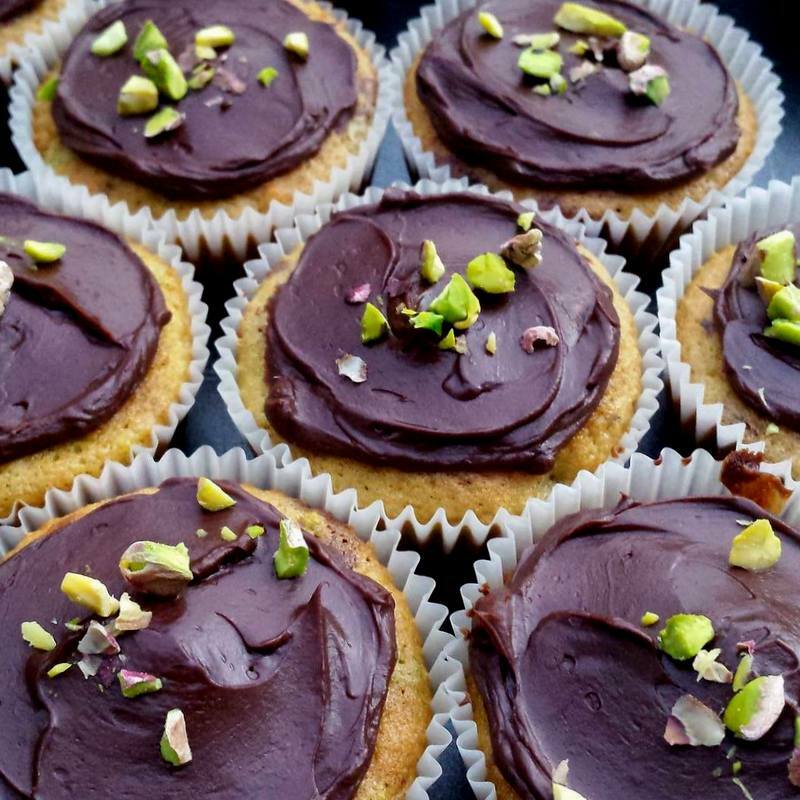 Prepare you your chocolate and pistachio batters in two separate bowls. For the chocolate: cream together the butter and sugar with an electric whisk, and add the eggs one at a time, until well mixed. Add the yoghurt and vanilla, mixing well. Set aside your electric mixer. In a small bowl, stir together the flour, cocoa powder, baking powder, baking soda and salt. Sift this into the wet ingredients, then fold together until just combined. Now prepare your pistachio batter: cream together the pistachio paste, butter and sugar with your electric whisk, and add the eggs one at a time, until well mixed, followed by the yoghurt. In a small bowl, stir together the flour, baking powder, baking soda, salt and the remaining 60 g of chopped pistachios. Mix into the wet ingredients until just combined. 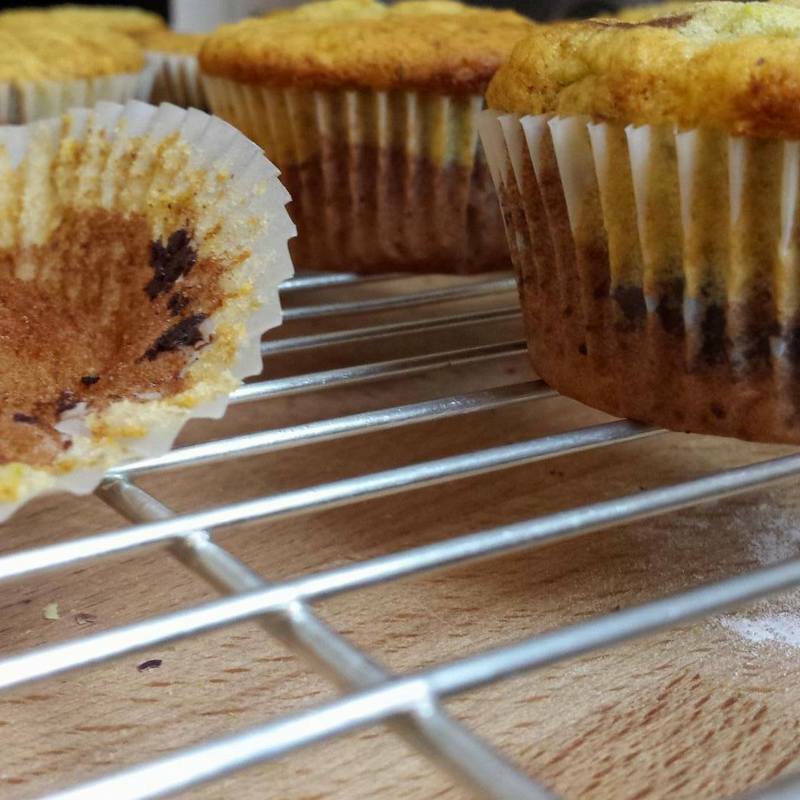 Put about 1 tpsb of the chocolate batter into the cupcake liners, spreading it around a bit with your spoon, and sprinkle the chocolate chips on top. Now place 1 tbsp of the pistachio batter on top, and spread out a bit to even it out. Bake for about 15 minutes until they are just golden, repeating until you have no more batter (I kept alternating my two cupcake pans). Let cool in the pan for 5 minutes, before transferring to a wire rack to cool completely before icing. Me too! 🙂 I’m going to add even more pistachio next time!